So far, you've only bought and sold stocks using market orders, which is essentially you instructing your online brokerage to "trade the numbers of shares I've instructed you to at the current price other people are trading this stock at". Your first stock purchase, WMT, was bought with a market order. Shortly after you made this trade, you probably noticed that WMT went a little bit higher or lower immediately after buying it. Then, later on in your training, we helped you sell a stock you owned by entering a market sell order. While simple market orders are fine to use, there are more advanced trading orders you can place. Let's walk through the limit order. Essentially, a limit order is an instruction to your brokerage to buy (or sell) a specified number of shares of a company when the prevailing market price is equal or lower than (or in the case of a limit sell order, equal or higher than) the specified price that you submitted. For example, in an earlier section of this guide, our example portfolio purchased shares of Wal-Mart for $70.35 per share. Now we plan to sell our WMT shares after they realize a $10, or roughly 20%, increase. However, rather than constantly checking the market several times in a single day, with the intent of entering a market sell order once WMT reaches at least $80.35 per share, we can submit a simple limit sell order to do that for us. 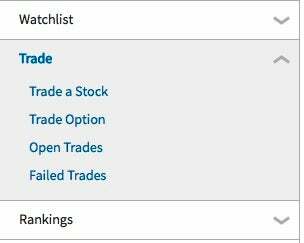 Click on the Trading tab near the top of the screen. Click on Sell for the Transaction type and enter 100 for the Quantity. 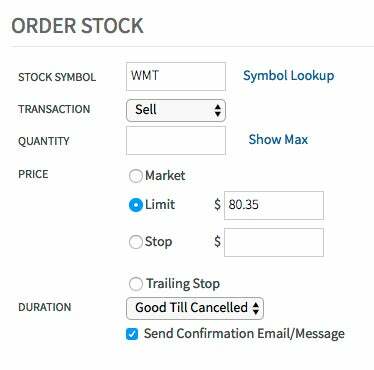 For the order price, you need to select the button corresponding to Limit and then enter 80.35 as the limit price - this will ensure your order to sell WMT shares will not occur unless you can get at least $80.35 per share for your position of WMT shares. 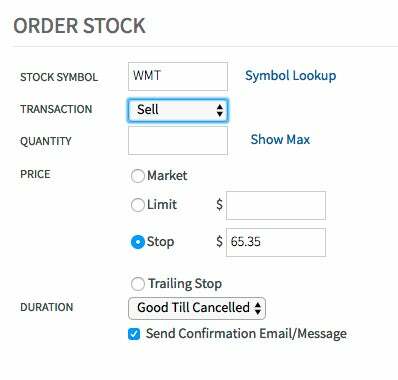 We keep the order's Term set at "Good Till Cancelled", which means the order will stay active and be processed once WMT shares reach or exceed your limit price. (*Note: We could have set Term to be "Day Order", which means the order would expire at the end of the current trading day if the order does not execute). As you can see, the use of limit sell orders is very useful if you wish to sell a stock at a specific target price, but are unwilling or unable to regularly check intraday or daily closing prices of the stock. Also, an added advantage of using limit sell orders is that they remove the emotional component of making trading decisions. Too often, investors will be tempted to hold on to a winning stock even once it becomes overpriced. Submitting a limit sell order immediately after you buy the stock is a good time to avoid any emotional complications, allowing you to better maintain your strategy and realize superior long-term returns. Similarly, limit buy orders are equally useful. You can enter a limit buy order with a certain limit price, which allows you to buy a set number of shares only if the stock's market price equal to, or lower than, the maximum limit price you entered. In our example portfolio we purchased WMT for $70.35/share with a market buy order. But perhaps we thought WMT was a bit overpriced at the time, so we could have used a limit buy order to purchase 100 shares only if WMT fell to $65.00/share or less. That way, we only buy at a price we believe is fair. If WMT does not fall to $65, the order will not be processed. Clearly, this type of order could work to our advantage as we can potentially realize greater returns if we can enter a position in WMT at a lower price. Now that we understand how to use limit orders to specify prices at which we want to buy or sell stock, let's walk through a stop order. A stop order, or stop-loss order, can be a useful tool for limiting risk exposure to a particular stock position. Essentially, a stop order is "dormant" until a stock's price falls to the specified "stop price". In other words, a stop order is an instruction to your brokerage to buy (or sell) a specified number of shares of a company when the prevailing market price is equal or higher than (or, in the case of a sell stop order, equal or lower than) the specified price that you submitted. In our example portfolio, we purchased shares of Google Inc (Nasdaq: GOOG) for $463.18 per share. Many investors use a sell stop order to limit their losses, meaning that they'll automatically sell if a stock goes down a certain percentage. Entering a stop order is an efficient and cost-effective means of limiting losses by avoiding the agony of regularly checking your stock and deciding whether to hold or sell it. For instance, if a so-called growth stock has headed south, an investor may choose to hold, hoping the share price might rebound, but if it doesn't, losses can quickly mount. Clicking on Preview Order and then Submit Order will finalize our stop-loss order, which will remain dormant in our Simulator account, only becoming active if WMT drops to $65.35/share or less. Stop-loss orders obviously cannot prevent losses from occurring, but it does make sure that small losses don't become big losses. Following the steps outlined in the above example, select a stock from your portfolio and set up a stop-loss order, specifying a stop price, say 20% (or whatever value you desire), lower than the purchase price. An important point to note is that stop-loss orders carry commissions just like any order, but only if it is executed. So, it essentially serves as a safety net that does not cost anything until it gets used. However, note that stop-loss orders and limit orders usually carry a slightly higher commission than simple market orders. The Investopedia Simulator charges $29.95 for stop and limit orders, while market orders only cost $19.95. Now that you've learned about stop and limit orders, try placing a few with the stop/limit prices near the current prices of your stocks. You'll see how these are executed automatically over time. While stop-loss orders can help limit your potential for serious losses, it's entirely possible to profit from falling prices - a topic covered in following section. Taking control of your portfolio means knowing what orders to use when buying or selling stocks. Stop-Loss or Stop-Limit Order: Which Order to Use? While both can provide protection for traders, stop-loss orders guarantee execution, while stop-limit orders guarantee price.